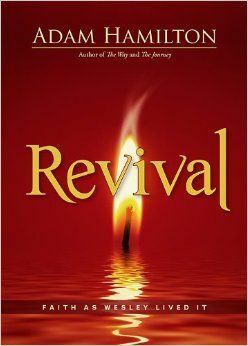 Revival: Faith as Wesley Live it on Amazon. Gotta love the Brothers Wesley and Mom Susanna! I'd hazard to guess anyone who has read any of United Methodist Pastor Adam Hamilton's writing enjoys it, too. Although "Revival: Faith as [John] Wesley Lived It" covers some basic doctrinal points, more than anything it provides a biographical and geographical overview of the spirits of the more famous Bros Wesley, John and Charles, and of the places they lived in and served in. I love the clear prose with its easygoing conversational style; largish print and relevant section headings help, as well. I frequently remember John Wesley never renounced his Anglican orders, and it's interesting that Anglicanism has a popular image of being a bit uppity and formal, while Wesleyan churches (Nazarene, Salvation Army, Pentecostal, Holiness) that actually are Anglican offshoots are known for serving among society's neediest. With that history along with the Chautauqua Institution, Chautauqua movement, and assorted revival movements with their reputation for taking the gospel to ordinary everyday people, it surprised me to learn that at first John Wesley thought it was almost wrong for an individual to come to saving faith in a place other than the interior of a church building. You also get maps, black and white photographs, and resourceful end notes. This book about John Wesley is another essential for any church library, and since it's quick and enjoyable reading, it would be a good choice to lend to one of those people you know who has too many misconceptions about church and Christianity. Final note: I love the bright, sculpted cover design, too!